The Criminal Cases Review Commission: Hope for the innocent? 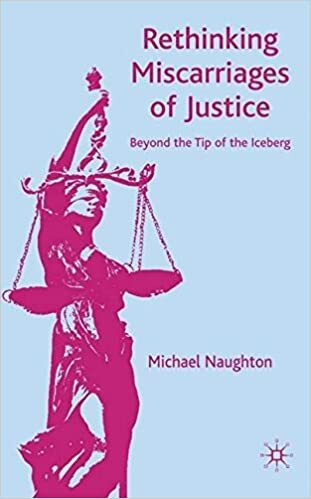 In this highly provocative and fascinating study, Michael Naughton radically re-assesses the notion of miscarriages of justice. Drawing on Foucauldian theory and ‘social harm’ paradigms, Naughton uncovers the limits of the criminal justice process and questions the dominant discourse that views miscarriages of justice as rare and exceptional cases of wrongful imprisonment. Arguing that the criminal justice process itself causes miscarriages of justice, and can prevent the overturning of convictions, Naughton interprets error as the norm – a mundane feature that is an inbuilt part of the legal system. Further, by redefining the term ‘miscarriage of justice’ he shows how it can be applied to thousands of cases per year. Extending previous analyses of the forms of harm that miscarriages of justice cause, this study explores the impact on a range of victims – direct and indirect – and their wider effect on society as a whole. Previous attempts to reform the system to prevent miscarriages of justice and their consequences have proved unsuccessful and here, Naughton provides an explanation of why they have failed and provides a new perspective on the ways to prevent mistakes occurring. Providing a much-needed critical appraisal of a fundamental aspect of the legal system, this book, now in paperback and with a new Foreword by Jonathan Simon, UC Berkeley, will have a dramatic impact on the way we think about criminal justice. Naughton, M. (2013) ‘The Innocent and the Criminal Justice System: A Sociological Analysis of Miscarriages of Justice’. Palgrave Macmillan. Naughton, M. (2012 ) ‘Rethinking Miscarriages of Justice: Beyond the Tip of the Iceberg’. Palgrave Macmillan. Naughton, M. (2012 ) (Editor) ‘The Criminal Cases Review Commission: Hope for the Innocent?’. Palgrave Macmillan. Naughton, M. (2010) ‘Claims of Innocence: An introduction to wrongful convictions and how they might be challenged’. University of Bristol (with Tan, G.). Naughton, M. (2019) ‘Rethinking the competing discourses on uncorroborated allegations of child sexual abuse.’ The British Journal of Criminology. 59(2): 461–480. Naughton, M. (2018) ‘Foreword’ in Diskin Bates, Michelle (2018) Stand Against Injustice: The untold story of the family of Barry George, wrongly convicted for the murder of Jill Dando. Malcolm Down Publishing Ltd. Click here for more information on the book and here for Michael’s Foreword. Huff, C. R., and Naughton, M. (2017) ‘Wrongful conviction reforms in the U.S. and UK: Taking Stock’ (pages 482-505) in Plywaczewski, E. and Guzik-Makaruk, E. (2017) (Editors) Current Problems of the Penal Law and Criminology. 7th Edition. Warsaw, Poland: Ablewicz Publishing. Click here for information on the book and the chapter.